Welcome back to the second “Tea Talk”! I explained my goal and concept for tea talks right here and you can check out everything discussed. Today, I want to address the issue of a “slump” and a lack of inspiration. This past week, I found myself feeling uninspired and down when it came to Instagram and the blog itself. It was truly the first time this happened to me. I consider One Swainky Couple to be a creative outlet and something that gives me energy and inspiration. We’ve taken breaks before, but only to create content. I couldn’t figure out why I was feeling like I was stuck in a slump and kept trying to snap myself out of it. After a few days of no change, I took it upon myself to take a step back. All of our blog posts were scheduled and I allowed everything to go on autopilot for just a little bit. This was the best decision. Brandon and I soaked up every minute of our weekend, celebrated his birthday, went peach picking, enjoyed lots of time outside, and all of the sudden, I was back to normal. I think there’s this unspoken pressure for us to post consistently, never skip a day, come up with content, stretch our creativity, and honestly, it’s exhausting sometimes. Coupled with the fact that it is the end of the school year, I was exhausted. Taking a step back and reevaluating our goals, content, and direction for the summer months was fantastic to focus on. Just that small break (plus a few really fun weekend activities) gave me all sorts of inspiration for the future. Can anyone relate with me on this? My go-to source of inspiration is travel. Anytime we go somewhere together, we both feel so inspired by the location, the people, the culture, the food, everything. 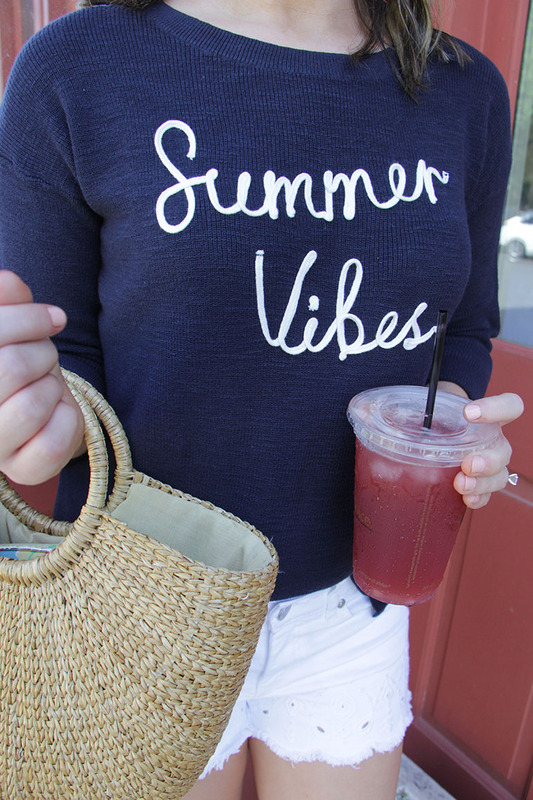 I’m so excited that we leave for Martha’s Vineyard tomorrow because I feel like it’s going to give another surge of inspiration. 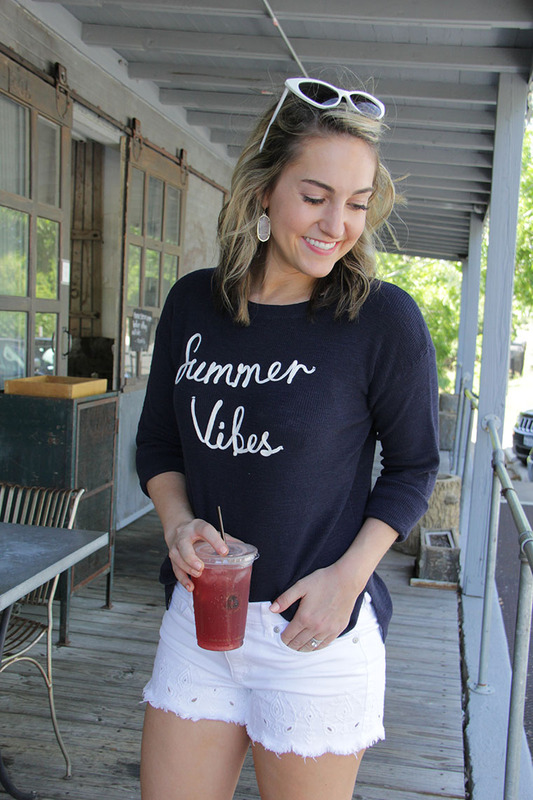 Now that school is almost out (literally just one week left, hints the “summer vibes” sweater), I’m also encouraged by my time off and the fact that inspiration can easily come on a day to day basis. When dealing with a slump, what’s your “go-to” method to snap out of it? Leave your tips below and keep the conversation going. PS: My entire outfit is currently 40% off! !